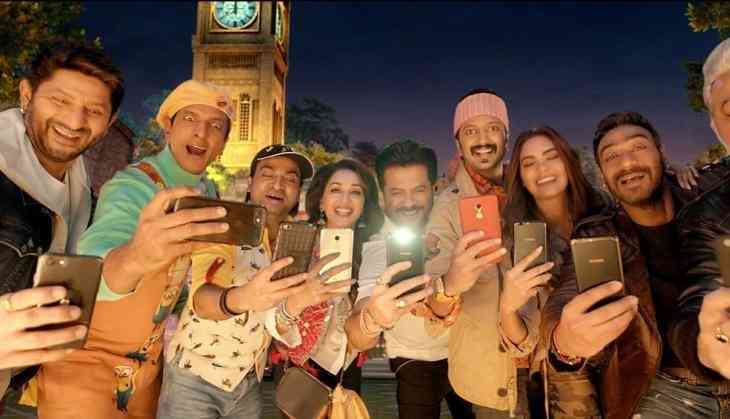 Total Dhamaal Box Office Collection Day 9: Ajay Devgn, Anil Kapoor, Madhuri Dixit and others starring film has finally entered 100 crore club after enjoying the second weekend. The film has made 5 different amazing box office records in 9 days only that are connected with the leading actors of the film. The trade analyst Taran Adarsh has shared these all five box office records and it is related to the leading actors Ajay Devgn, Anil Kapoor, Madhuri Dixit, Riteish Deshmukh, and Arshad Warsi. #TotalDhamaal crosses ₹ 💯 cr... Biz jumps on [second] Sat... Mass circuits [excellent] and metros [good] collectively contribute to the growth... Will score higher numbers today [second Sun]... [Week 2] Fri 4.75 cr, Sat 7.02 cr. Total: ₹ 106.32 cr. India biz. According to the trade analyst Taran Adarsh, the film Total Dhamaal entered 100 crore club with a bang as it collected 7.02 on its 9th day. With this, the total collection of Total Dhamaal goes to 106.32 crores and the film will also get a good collection on the 10th day as well. According to the trade analyst Taran Adarsh, Total Dhamaal has become 9th 100 crore film for Ajay Devgn, 5th 100 crore film for Riteish Deshmukh, 3rd 100 crore film for Anil Kapoor, 3rd for Arshad Warsi as well, and it is Madhuri Dixit and Javed Jeffery's debut in 100 crore club. Now the interesting thing is that the film is still earning and the overall collection of the film will reach to an unexpected level. #Dil, #Beta, #Raja, #Ishq, #Masti, #Dhamaal... Indra Kumar has delivered a string of hits... With #GrandMasti, he delivered his first ₹ 100 cr film and now, with #TotalDhamaal, Indu ji - as he is affectionately called - has again proved that he knows the pulse of the audience. It looks like that the year 2019 has really gone successful for Bollywood so far, till now 4 films Uri The Surgical Strike, Manikarnika The Queen of Jhansi, Gully Boy, and now Total Dhamaal have entered 100 crore club. While talking about overall so till now Bollywood has only disappointed with films like Ek Ladki Ko Dekha Toh Aisa Laga, Why Cheat India, The Accidental Prime Minister. Also Read - Do you know not in SOTY but Alia Bhatt was supposed to make debut with Ranbir Kapoor in Bhansali's film?